Cancer is a vile disease. It comes in many forms—attacking, maiming, and many times killing its victims. After heart disease, cancer is the second leading cause of death in the United States. Sadly, a jaw-dropping 38.5% of American men and women will face and fight this awfulness at some point in their lives. Let’s imagine you’re diagnosed with cancer; maybe even a particularly deadly one like lung or colon cancer. You get the diagnosis—and the facts are clear: you WILL die without treatment. Yet, there’s a decent chance that your life will be spared through treatment. You see the scans and the data; you listen to your doctor … and then you promptly shove him or her aside and march out of the office. Your doctor comes running after you, imploring you to reconsider. You shove the doctor aside again. Seriously, would you expect adoration for rejecting the cure to your awful diagnosis? Probably not. And yet, that’s exactly the sort of logic we get from the Bill De Blasios and the Andrew Cuomos of the world following yet another attack from cancerous Islamic terror. “We go forward together and we go forward stronger than ever, we’re not going to let them win, and if we change our lives, we contort ourselves to them, then they win and we lose,” said New York Governor Andrew Cuomo. “…New Yorkers are strong. New Yorkers are resilient. And our spirit will never be moved by an act of violence,” said New York City Mayor Bill De Blasio in the same presser. Yes, New Yorkers and all Americans ARE strong, and we ARE resilient. It’s precisely that American spirit that launched us forwarded from 13 struggling colonies to the world’s premier superpower in just a few hundred years. I’m certainly not here to debate that. But when “strength” and “resilience” are praised over and over again by politicians who in nearly the same breath work to prevent that which has a good chance of STOPPING the cancer that is radical Islam, those words take on a different meaning. Strength and resilience become acceptance. Just like London’s mayor Sadiq Khan once said that terror is “part and parcel of life in a big city,” words like “strong” and “resilient” describing a big city’s citizens, with little to no action to protect those same people following the use of those words, speak the exact same message: just get used to it. I didn’t even flinch when I saw the news of this latest attack come over the proverbial wire. It’s become so commonplace around the world (and increasingly so here) that—while it pains me—I didn’t even flinch. And why is it so commonplace? Our leadership both here and around the world flat-out refuses to get serious—because they’re more concerned with the rights of those trying to kill us than with those being killed. Mayor Bill De Blasio ended police surveillance of mosques with suspected or known ties to terror, like the mosque where the New York attacker Sayfullo Saipov was likely radicalized. Governor Cuomo has been vocal in his criticism of President Trump’s concern over the Diversity Visa Lottery program that allowed Saipov to enter the United States in the first place. But sure, we’re “strong” and “resilient,” so we should feel better. Yes, let’s bookend every terrorist attack with “strong” and resilient” … while we work harder to fight the Second Amendment or ensure that an illegal alien gets a tax-payer funded abortion than we do to deal with the global cancer that is radical Islam. If liberals fought as hard against radical Islam as they do against our Constitution, or for abortion, or to spread the demonstrably false message that Republicans are by and large racist domestic terrorists (see: Latino Victory Fund’s disgusting campaign ad depicting a GOP supporter trying to kill minority children) … imagine where we’d be. After the horrific Las Vegas and Sutherland Springs mass shootings, liberals came out en masse against the tool used to carry out the attack—some even going as far as to claim that Republicans had “blood on their hands” for supporting a core tenant of our Constitution; one that sets us apart as free citizens. What liberals routinely miss (or purposely ignore) is that the Second Amendment does not cause evil. It can be used for evil, yes—but it is not “inherently” evil; no more than a butter knife is inherently evil for being used as a weapon to kill someone, or a car for the same purposes. 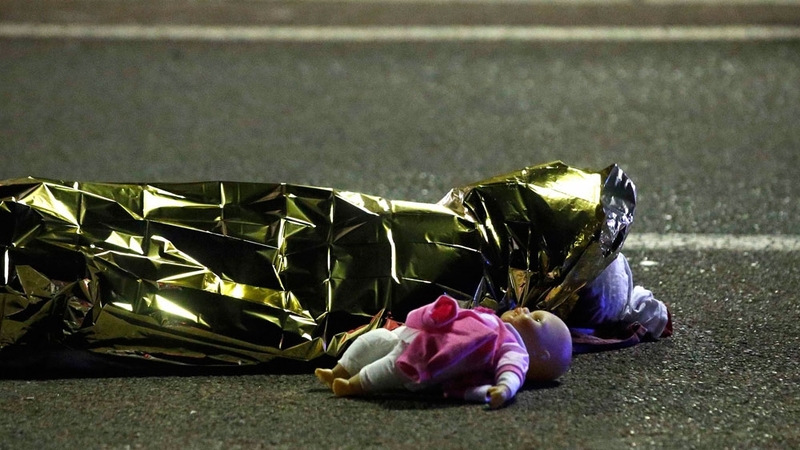 Radical Islamic tenants that hold that women are to be violently subjugated to men, infidels are to convert or be killed, and freedom-loving Western nations are to be destroyed one innocent, obliterated cyclist or child at a time—THAT is inherently evil. THAT is evil incarnate. And it’s a fast-growing, wide-spread global cancer (whose “lone wolves” have quickly become a massive pack) that liberals refuse to fight, because it might “offend” someone. Well, exactly. Liberals like De Blasio and Cuomo and countless others work far more tirelessly to preserve the image of Islam than they do against the scourge of its radical adherents’ terrorism—and are far more concerned with the virtually non-existent “backlash” against the Muslim community in the United States than they are with facing and FIGHTING the problem. Whatever you want to believe about Islam (i.e that it’s largely a religion of peace infiltrated by a “radical fringe,” or that its “radical fringe” is its core, and the non-radical adherents are the truly “radical” ones for refusing to buy into the terrorist platform)—this is a cancer which has reared its ugly head time and again in our country and around the world, particularly in places like Europe where those nations have thrown aside national security in the name of political correctness and “diversity.” The bombings, the shootings, the stabbings, the vehicle attacks—they’re all perpetrated by people unified by a single belief: Islam has a right to subdue the world through violence. And unless we couple our praise for strength and resilience with strong and unyielding action against this growing cancer, what’s the point? Are we not ultimately sacrificing ourselves and our children on the shared altar of diversity and political correctness? We CAN face and fight the cancer without turning into this cartoonish, racist, hate-mongering über-bigot that the left loves to think we are if we dare speak up against the problem. Yes, welcome immigrants into the United States, but let them in based on merit (in other words, don’t just hand out visas solely in the name of more “diversity” in our immigrant pool) and vet them based on whether or not they’re going to bring more cancer to this country. Yes, promote freedom of religion—but recognize and accept that when a group of people (in the name of religion) threaten the United States, allowing them to continue to plot and plan against us is no longer freedom of religion. It is subversion of everyone’s most important right: the right to LIFE—and it is our authorities’ duty to protect us from that abuse. Yes, celebrate cultural diversity—but not at the expense of those already here to whom you (yes you, Mayor De Blasio, et al) owe primary attention and protection. And most importantly, don’t let our “resiliency” become acceptance.